Challenging times continue for automobile majors, with their monthly sales numbers on a decline. The latter is due to subdued consumer demand caused by slowing industrial output, tight liquidity, non-availability of retail finance, higher interest rates and moderate economic activity ahead of general elections in April-May. Sales for the commercial vehicle (CV) segment were mixed. The segment continues to face challenges due to liquidity, non-availability of retail finance and delayed impact of new axle load norms. The same for the tractor segment was also weak in January on lower-than-expected rabi crop sowing. Three-wheeler (3W) sales were mixed due to a very high base of last year. Volumes for two-wheeler (2W) space were also mixed. Subdued market sentiment, liquidity woes, financing issues, rising interest rates and slowdown in economic activity dampened demand for CVs. This was, further, marred by the lag impact of new axle load norms. The long-term outlook, however, continues to be positive due to the government’s focus on construction and infrastructure and increase in mining activity. Tata Motors saw a nine percent year-on-year (YoY) fall in CV volumes led by a 16.3 percent and and 4.2 percent decline in medium and heavy CV (M&HCV) and light CV (LCV) segments, respectively. Surprisingly, Ashok Leyland’s monthly volume rose 12 percent driven by strong showing in both M&HCV and LCV segments. M&M too posted a growth of eight percent in the CV segment. However, Eicher Volvo saw a significant sales decline (12.1 percent). Increase in the total cost of ownership led by rising interest rates and mandatory long-term insurance dampened consumer sentiment. Hence, companies in this space have posted a muted/decline in PV volume for January. Market leader, Maruti, posted a two percent volume decline for the month. M&M performed a tad better, announcing flat growth (0.8 percent). Tata Motors’ passenger car segment grew a percent YoY. Its management expects strong months ahead on the back of launch of its new SUV — Tata Harrier — in January. In the two-wheeler space, Bajaj Auto leads the pack with a 24.7 percent growth, led by aggressive pricing actions undertaken by the management in the entry-level segment. The impact of this continues to be severe on Hero MotoCorp, the segment leader, which saw a 9.2 percent decline in monthly sales. Eicher Motors also continues to announce disappointing numbers, with January sales declining 6.6 percent. Monthly sales for TVS Motor Company grew two percent on higher bike sales (12.8 percent). TVS posted very strong growth (51.6 percent) and M&M grew 26.5 percent. Bajaj Auto, the leader in the space, saw its sales decline 28.1 percent due to higher base of last year. Monthly sales for the tractor segment remained mixed with Escorts recording a YoY growth of 11.7 percent. The same for M&M declined 0.7 percent. The management said increased focus on agriculture and rural infrastructure will drive positive sentiment and future demand. 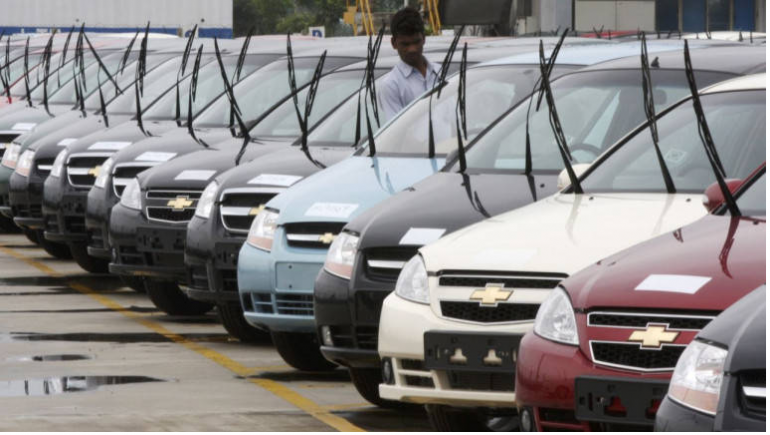 Maruti, Eicher and Tata Motors saw their sales decline, whereas M&M, Bajaj Auto, TVS, Eicher and Escorts witnessed a growth in January. Tata Motors’ management attributed this decline to the current liquidity crisis in Nepal, formation of a new government in Bangladesh and political uncertainty in Sri Lanka.